Loosing track of time sometimes LOL! It was a quiet weekend, but Friday I told you that perhaps Saturday Jan and I would go to a fair? Well, good that Jan has his brain intact, cause he told me that it wasn't there yet, it takes place next Saturday LOL! So much for plans for Saturday. But.... Friday I did go to town centre, to see if finally I could find a pair of shoes. And I did. I even bought TWO pair of shoes. And I found them for a ver good sales price. Here is sitting a very haooy girl! It isn;t always easy to find a god pair of shoes because I have a sooo small foot size, It is 32-33 European(which is about size 0-0,5 for UK, and size 1-2 for US), I;ll have to find them in the children's department! But I did need some shoes for every day, and I wanted a sports looking one. And then I found a pair of boots, ankle high, they are great for autumn and winter, because they are fur lined, nice soft and warm. This weekend from early morning to really late evening we had to cope with some carpeting noise from our neighbours on 1st floor. I have no idea what they are working on, it sounds like they make a whole new floor, well, that's still okay, but sometimes they have some music on and on a very high level!Hope they will soon finish it, and cross my fingers that they will not touch any waterpipes! Specially annoying is the constant booming bass sounds..... BOOM< BOOM< BOOM. And as it is nice weather, they have their doors/windows open and then at times musci is real loud! I already asked once if they could have some consideraion with the neighbourhood, okay they turned it to a much lower level, but sometimes ....pfff. So yesterday Jan had a little bit enough of it and started an offensive LOL. No it wasn;t that bad, but we sometimes have a little nusic hour and yesterday he played a lot of real old songles on the turntable, and oh was it nice! The "oldies"still are good to listen too. I do have some new photos from the garden. One of our other dahlia's is coming to bloom. The flower isn;t yet opened completely, but look at that gorgeous color! Then in early spring I bough a little Abutilon, and it growed rather well, still can become much bigger, but it has already lots of flowers now. In another border I have standing Lavatera, and it is full with buds and flowers. Love that plant. Our Petunia;s are doing well too so I made a picture of one of them, and behind it you see our green beans, starting to actually getting beans! I've put a little yellow arrow to point it out. The few branches of the greens beans have lots of flowers, so we might have a nice little crop. We should find a place to grow a few more vegetables next year. May be if I can find some wooden crates, we can put them together to form a small veggie garden. A garden always keeps you busy! And now is a good time to make some notes, what grows well and what isn;t, and which plants have to be put on another place. Today, as all days, there is the soccer event. We did see some real attracting matches and I have to congratulate the Americans with their team. They are doing really well, as some other teams too. And the "big"teams are disappointing a bit, well, some of them. The Dutch did win their second match, with some difficulty, and today they will have to play again, which will decide who will be group winner in the 1st round. Hmmm, they will have to play Chili, and that could be a very difficult match for us. We'll see, already nice to know that they reached already to the second round, but of course we hope they will win this match too. Well, that's about all, I think today out house can do again with some dusting and vacuum cleaning, yesterday I already changed the bedsheets, always happy when that is done. I have the second part of the Lost in a Dream kit for you. We could do with a few degrees more! Last couple of days the weather isn;t quite as I would like it to be. Temperatures are a whee too low, and the sun isn't showing much either. But according to the weather forecast the coming days temps should rise a little bit and we will have more sunshine again. Okay, we will hold on to that hope. Not much going on here the last two days. We have now containers in our street and neighnourhood for the garbage bags. In a way it's a good thing, no more piles of sacs every week at the sidewalks, and often they are picked open by the seagulls and that makes a mess on the street. But now we have to walk with our sacs to a container, and there aren;t too many of them, still we are lucky to have one not all to far away from our house. Short news about our soccer team, they did win their second match too, although it was a rather touch match! They will have to play another match in this 1st round, but they are almost certain for a place in the 2nd round. Okay, so far, so good. Told you about the offer of the supermarket for that 40 ltr. sac of garden soil. well, Jan was busy with some things that day so I went alone to buy it. Took my shopping car, of course and took one home. Gosh, it was a big sac and a bit heavy, So I struggled to get it into my car and there was a nice lady who came to help me with it. I was sooo grateful to her! Arrived home and Jan had to take it out LOL! Good that I bought that soil, cause I used up the last bit we had still standing around. I had to repot some seedlings again. Soooofunny, some weeks ago I still had some stew pears I cooked for us. Had to clean them first, of course and though: "Why not take some seeds and try planting them? "so I did and now I have 4 new started pear trees LOL! They grow well, but if they become taller I have no idea where to put them! Perhaps I can place one later in a big planter and see what comes of it. If tomorrow the weather is a bit nicer again, Jan and I will visit a little fair not too far from our house. It would be a nice little walk. No idea yet what I will do today. Perhaps first a little housework and may be I will take another trip to town this afternoonand see if I can find myself a new pair of shoes. Usually, when I go to buy something specific, I don;t find it, but come home with other things, LOL! Okay, in a way that is nice too, because then I found stuff I was looking for already, but now stumble upon them for a nice reduction price. 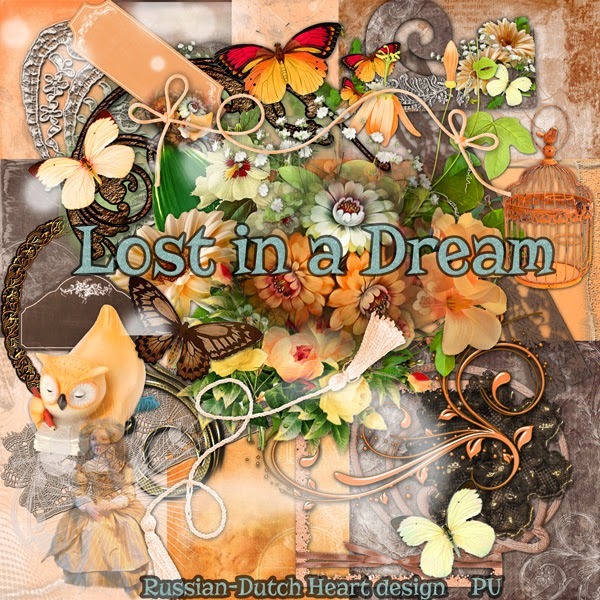 Freebie today is part one of a kit named "Lost in a Dream"I really like the colors of it. See you back on Monday, wishing you all a fantastic weekend! Yes, weather definately changed a bit, certainly the temps are lower, but as soon as the sun comes through it still is lovely weather. Raining this morning, okay, that's good for the garden, but I hope later it will stop and some sun will shine again. Monday I wanted to do some "serious"work in the house and guess what? I did so LOL! First gave all the house a good sweep with the vacuum cleaner and then thres myself on the closet in the storage room, where I keep all the cleaning stuff, and shower/ shampoo things and such. I sorted that out, re-arranged it a bit and it looks much better. Also we have some racks there where I keep storage boxes and cans, pots for indoor plants, toilet paper etc. Sorted that out too, re-arraanged it too and I was quite happy about the result. Sounds not too much work, but it always takes more time than you think. Anyway, I was a little happy lady after i finished. Yesterday I had to do some shopping, weather was nice, so I did it in low tempo. In the supernaket they had an offer for garden soil, a big sac of 40 ltr for only € 3,00. I didn;t took it with me, would be too heavy to carry home even with the shopping car, so perhaps Jan and I will go there and take one home. Then we will have more than enough for about the whole year, I think. Coming home I noticed a little "mess"in the hallway, and saw Jan busy in the toilet/shower room, painting the ceiling and part of the walls that have no tiles. As we had the leak earlier this year, it needed to be done and now it looks all wonderful and fresh again. Jan also phoned the plumber on Monday to make an appointment to clean out cv-kettle and talk about some other things that still have to be done. As the man was busy on a job, he asked if we could call him again next Monday. So I guess soon we will have a few days of a little mess again in the house, sigh! Hopefully he will not charge us too much for the work on some pipes and a fixing of a part of a floor(yes, he also does some other construction works). Good that is about all the news today. But I still have some photos for you from the garden. I'll start with the two containes we just filled with some new plants I bought the other week. Now the Astilbe is starting to bloom, I love those plants, they are so elegant. Should try to find some more of them in other colors and they are easy to grow, you can divide the clumps and replant them. They do well in partly shadowed places and like moist soil. Another hydrangea started to bloom, this one is reddish and I love the color of the foliage of this one. I should try to make some cutlings this year. And oh my, our lillies bloom and I just LOVE that color! This evening our football team has to play again, and I do hope they will play as well or perhaps even better as the 1st match!! 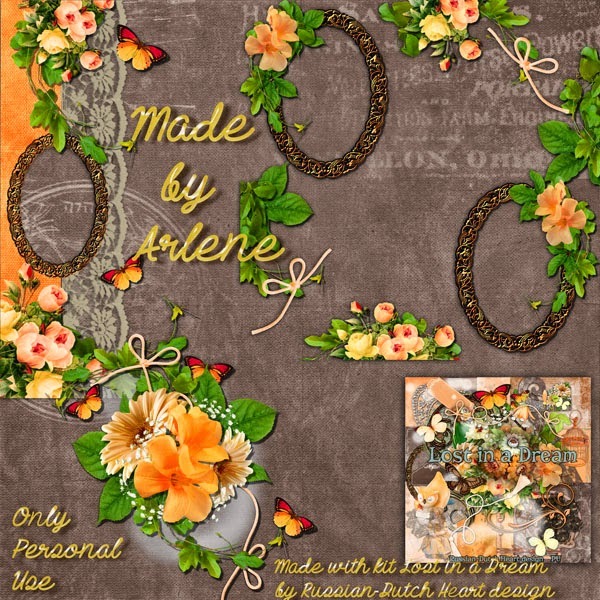 Freebie for today is the add-on of Arlene to the Bedtime Stories kit. 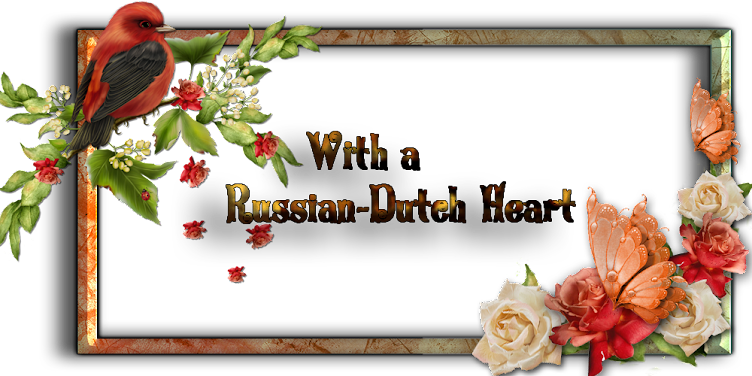 That girl makes fantastic things, as now again, you will get a frame cluster, a lovely page overlay and also a quickpage, I think you are a bit spoiled by her ROFL! Golly gosh, it was an enervating weekend! Saturday I made us a big pan of soup for dinner and we had that also on Sunday. How easy but still tasty and I made the soup well-filled, so it did fill our stomach. Although the weather changed a bit, we still had nice weather, only today it is cloudy and even is raining a bit. I hope there will be enough rain to wet the garden so we don;t have to water it ourselves. Our first tomatoes appeared on the plants. Of course they are still tiny, but there is a beginning LOL. I will try to make a few photos of the garden later this week, from the new planters and also from some lilies that start flowering. But as I already announced on Friday, this weekend would be filled with sports and we had some gret successes. First on Friday there was the soccer WC and our team had to play against Spain. And how well they did, they really surprised all fans. Spain was beaten with 5-1 goals, amazing! 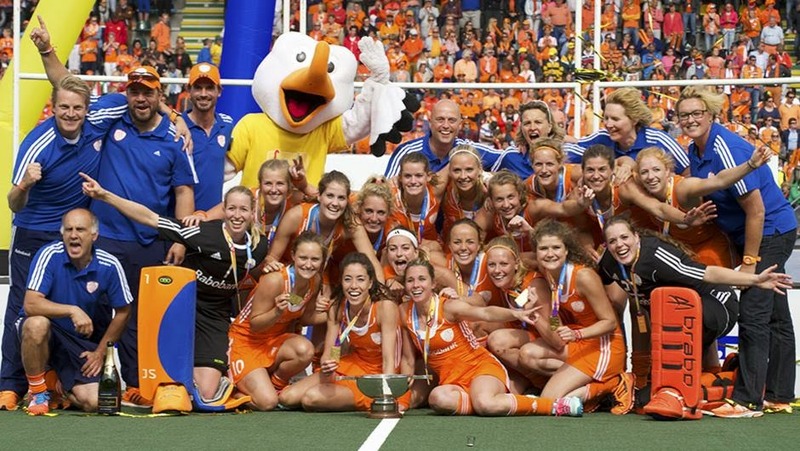 Saturday there was the final of the WC field hockey, The Netherlands against Australia for women teams. And our ladies won the gold! Sunday the men had to play the final, also against Australia. That wasn;t such a success for us, the Australian team was way to strong for us, so congratulations Aussies! Still we can be proud of our men team, they have the silver, still not bad at all! Today looks to be a good day to do some work in the house, as long as it isn;t so sunny. Definately the house can do with a good dusting and vacuum cleaning. And if there is still some energy left, I might sort out a few cupboards in the kitchen. Not promising but I will try ROFL! 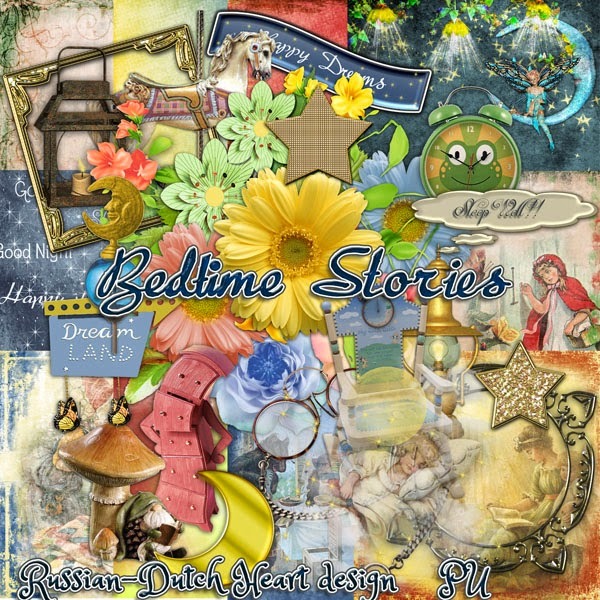 I have part two of the Beftime stories kit for you. As I finished even another kit yesterday, I may be can start with a new one after this posting. Not yet sure what it will be, but after I decided what color palette I will use, surely something will come up. Clear sight through our windows! Gosh, I;ve been a little busy bee, which is a rather good feeling. Wednesday, after I did my blogpost and made some papers for a new kit, Jan and I first took a cup of coffee in the garden, and had an inspection of the garden. Then I went out for some food shopping, I was quick and it didn;t tke too long. As it was still just around midday, I thought I might as well keep busy and I cleaned the windows at the front of the house. Oh boy, what a change that made ROFL!! It definately was needed and now we have much better sight at the street, they almost sparkle. Still had almost all afternoon, so I decided to go to town centre, I can do with a new pair of shoes, but I am picky. I don;t want to spend really too much money on them, and they have to feel good on my feet the moment I try them in the shop. So I tried a lot of pairs, but no, couldn;t find something I really liked. Well, I will have to go for that seach another time again. But I did find a sweet sweater, just right for the cooler days in summer. Took home also 3 more garden solar lights, some noodles soups for Jan and that was about it. Oh, I checked out some shops, and took my time, but after that i went home again, a little bit pooped out but okay, had a nice time. Yesterday I had to deliver a couple of bills to the bank, it was great weather for a little walk, and found some treat candies for our cat, and bought me a little net that I can use for the pond. Then the afternoon we spend home, watching the semi finals hockey for women teams, one in the afternoon and one early evening. Yeah, our women team is in the final! They will play against Australia. Today our men's team will play the semig finals, I hope they will do as good as the women! And this evening our football team will play it's 1st match at the World Championship Soccer. Oh boy, what a busy day today!! Not much time left for other things, I guess, which isn't too bad, I already promised myself an easy day, to also enjoy a bit the still lovely weather in the garden. May be tomorrow we will have a bit of change, some rain could fall and temperatures will go down a bit too. Some heaven-water wouldn;t be bad for the garden. It is still early, so after i finish this post, I can do some work on the new kit, then wake up Jan and have a coffee together in the garden. Kit today is named "Bedtime Stories". I remember the times I went to bed as young kid and my parents read me a fairy tale, either already in pyamas sitting on the couch, or already in bed, and then always wanted a story more! 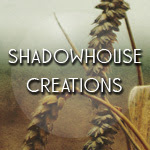 Today there is part one, next week the other one and some fantastic add-ons from Arlene! Have a wonderful and happy weekend! Quiet days and nights with lovely weather(okay, at night a rainshower of two), even yesterday I catched a little bit of rain, when I was out shopping. Oh, it wasn'by far enough to soak me, I just waited for a few minutes under a shelter and voila, I could continue. Last week i received a new bankpass from the bank, but i didn;t try it out yet. So i did yesterday and I was glad it worked well, LOL. 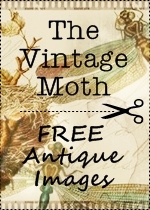 You can laugh but it happened to Jan a couple of moths ago, he received his, and treid it out and it didn;t work! So we always keep our old one intact, and not shred it before we tried the new one a couple of times! Before I went out for the shopping yesterday, I gave Jan a haircut. He looks a lot better now, hahaha! Oh, Jan found us a nice little table for the garden. Till now we used an old thing, that wasn;t too steady and just a bit too small. Yesterday he came home with a big smile on his face, carrying that table. 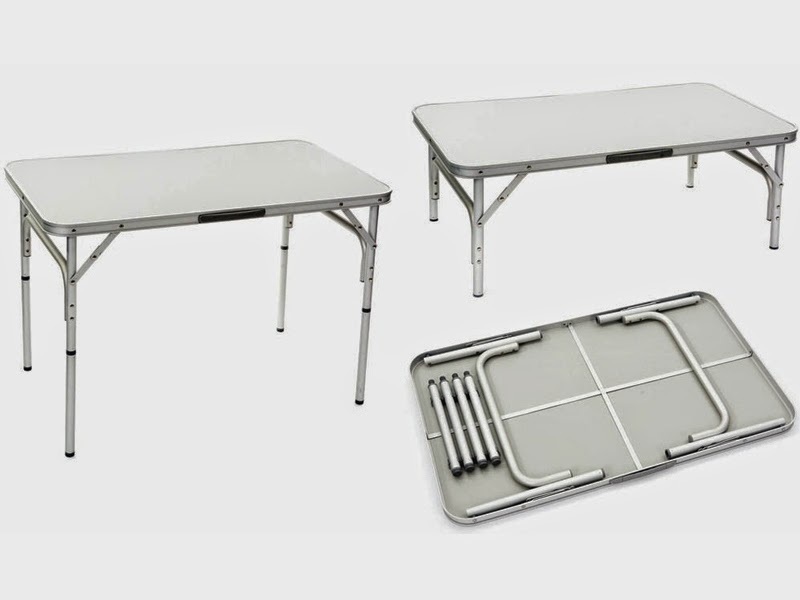 In fact it is a camping table, so we can fold it up completely and put it away at wintertime, it even has a grip on it to carry it( and it is very light to carry). Found an image of it on the net. Probably it is not a super quality, but for now it is good enough and just a nice size. Now one thing we should change is our rose/clematis bow. I fear it will crack sooner or later, because it is of rather low quality iron, and the rust on the connections will weaken it more and more. I would like to make one of wood, which should be rather simple, and give it a good coat with woodstain and put it into the ground in special supports. Perhaps we can buy already the materials but putting it on it's place might have to wait till next spring, when I have pruned both the climbing rose and the clematis, so that they will not be damaged. Now I also have to find a way to clean every now and then our little pond. Yes, I know, we could place a filter and all that, but we want to keep it simple. Only our "tendants"the frogs, don;t want to wipe their feet before they jump into the water, so slowly the dirt sins to the bottom it has to be removed every now and then. Only I dug in the pond, so cannot easily take it out LOL. But... I think I can put a kind of low container on the bottom, perhaps even with tiny holes in it, that I can take out and then throw away the soil and such that sunk to the bottom. Just have to find the right size for it. But i think it might work. Oh sometimes so many little problems keep me busy ROFL! Nut what a great feeling if you find a workable solution, hahah! Time to devote a bit of time to housework again today, such as some ironing and may be finally do the windows at the front. I think it will stay dry the whole day, so I should give it a try. And the rest of the week we will be spending rather some time watching tv, cause tomorrow and next day there are the semi finals of the hockey tournament(both our teams are playing them), in the weekend the finals and tomorrow already is the start of the World Championship Soccer, and in between I believe there is also some tennis at Queens in Londen, and as we like to watch sports, we will be busy. I just don;t have to high hopes about our soccer team. Perhaps they will do better as we think , and they might grow during the matches. 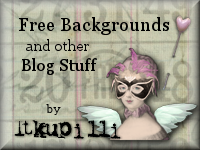 Time to finish this post, but not without a freebie. 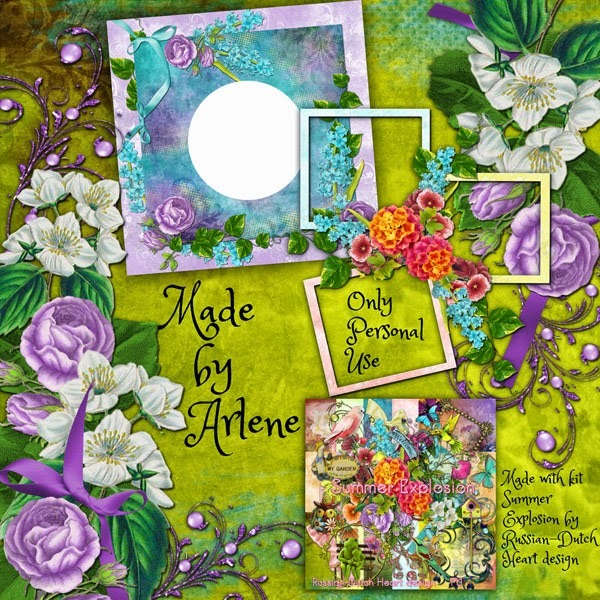 This time the add-on from Arlene, and it's again a lovely one, to complete the Summer Explosion kit.She made you a spectacular page border, wonderful quickpage and great frame cluster! Well, we are having some real summer days here, so warm we even could leave the garden doors open yesterday till the time we went to bed. But we had also some fierce rainshowers, most during the night, it seems that Saturday night there was even some thunder and lightning, according to Jan. I didn;t notice any of it LOL! Friday Jan and I went to the market, it was such nice weather for it. We came home with strawberries, mini cucumber, some cheese, prunes and mandarines. So we can take in a lot of vitamines! With the rainshowers and warm and sunny days you almost can see changes in the garden every day. Saturday when I was out for the newspaper, I couldn;t resist walking to the flowershop where they have lots of garden plants too. And I came back with some. We have two cannisters, where Jan plated bulbs, but they don;t performe very well. Lots of leaves, but still no sign of a bud. So I wanted to change that into happy and colorfull cannisters. We planted the bulbs in another one(cause you never know if still something lovely comes out of them ) and replanted the two, close to our sitting place at the patio. Of course I;ve made a picture of one of them. We have a lupine in the middle, srrounded by little carnations. They have all sorts of candy like colors. Made another photo of one of the anemones that do their best giving lots of flowers. And the first of the dahlia's came to bloom! This one is a rather tall plant, with a lovely flower. And soon another specious will come to bloom too, which only will have about 30-40 cms of hieght. Then we are of full expectation still of the real tall ones we planted, about 80 cms. high and should have a BIG flower. But here the photo of the 1st, not completely sharp, I think, but well enough to see how sweet it is. So slowly more and more is starting to bloom, and keeps us busy, pinching out the dead flowerheads. We also enjoyed some great matches from our hockeyteams. They still have to do one match in the 1st round, but already are sure of a place int semi finals. Also have to congratulate the American women team, doing great as well as the Australians, last one both men and women and the Belgian men team is doing very well too. So still exciting matches to come, to see which will reach the semi finals! Only the frist two of each pool wil go through. We will certainly enjoy the summer day today, as for the rest of the week there will be some temperature dropdown(weather is still acting like a yoyo), although there will still enough sunshine to enjoy. Today also is the birthday of my mother, who already passed away a long time ago, but I always put on a light at such days. Almost impossible to imagine that if she stayed alive till now she would have 98 years of age! That shows how quickly we grow old too LOL! No. I am not really sad, it is life and it happened a long time ago, but no matter how long ago, she still is near to me, into my thoughts and heart, as well as my father. Now time for the second part of the kit Summer Explosion. I am busy with another kit, almost ready, yeah, but must find a name for it. Hmmm, something will pop up when making the preview(I hope). You all have a marvelous day, see you back on Wednesday, with Arlene's add-on, and that's super. Today is the start of a warm weekend! After a couple of rather fresh days, with rain every now and then, today it looks a lot nicer already. And it will be the start of a warm, may be even hot weekend. Well, I don;t mind too much, perhaps it will warm up our house a bit, It is nice when the weather is good that the house stays a bit cooler, but ours is sometimes too cool. Jan's visit at the doctor seemed to be okay, anyway he didn;t have to stay there LOL. However she wants him to have a gastrocopie( he has that every once in a while) and a MRI of his belly, just to be completely sure all is still in good working order. Well, I like it that she keeps a good eye on him! It's a very good doctor, honest and clear to her patients, rather direct if necessary, also a very sweet lady with good sense of humor. Oh we even had nice post in the mail from the tax office. It's only the "preliminary" but it seems we get some nice money back. Normally there is no change in the outcome of the tax stuff, so hopefully soon it will be on our bankaccount and can it stay there. It will give us some "air"to let some things done in the house, mostly according to the central heating. The installation needs a good clean and perhaps some left over old pipes can be changed too, so we will have not to worry about leaks there anymore. Oh, we will still keep some money "in reserve", but it is nice to know you can have some things done finally. Topday the weather should be much nicer and already a bit warmer( it sure looks that way, looking out of the window), so it will be a good day to go to the market. We didn;t make it on Wednesday, because it was raining on and off and not the best day for a walk. Then the rest of the weekend I think we will stay putt, cause they expect a serious rise of temperature, and then it will be nice to sit outside under the parasol, and just enjoy great weather. I will have to phone my friend Heidi for sure today, because it is her birthday.! If she is a wise girl, she will take advantage of the weekend, which is extended here due to Pentecost(here we have sunday and monday ), to take it easy, perhaps go somewhere with husband and daughter, and not having a bunch of people coming over for her birthday LOL. As much as it is nice to have family and friends visiting, it's also nice sometimes to celebrate a birthday in very small circle! Looking forward to the warm weekend, yes we are! and we have good news from the hockey tournement too! Yesterday our ladies team won their 3rd match, so they are almost sure into the next roud. Today the men will have to play their 3rd match of the 1st round, they also are pretty sure to be into the next round, but best is they win this match too(to be completely sure LOL). Here your freebie for today. 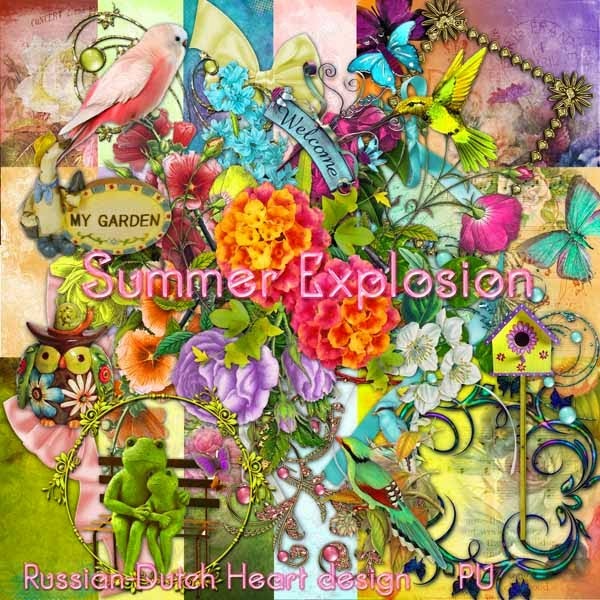 Named "Summer Explosion"and it is a happy looking kit, with bright colors, to give you the feeling of Summer. As you have noticed, I found another shoutbox, couldn;t get the other one working again, so looked around and gfound this free one, and it looks okay. Funny how you get used to it and read the messages whenever I am on my blog. Wishing you all a happy and wonderful weekend! Nothing much happened the last couple of days. Yes, it sounds kind of boring, it may be so, but it's also feeling very comfortable and relaxed LOL. Of course we are still following the field hockey championship and till now our teams are doing okay. But there is still along way to go to reach the finals! Tuesday morning, when Jan woke up he asked me some time later, if I had a nice dream that night. I answered I didn;t know, I didn't remember anything and then asked why he wanted to know. He told me that somewhere during the night I started giggling in my sleep, and it seemed I had a lot of fun!! Well, that is a lot better than waking up from a nightmare, but it is also sad I didn;t remember anything! The mind can play funny tricks with you LOL! I was not very active the last days, okay, did a bit of vacuum cleaning, some grocerie shopping, but most of the time I watched tv, knitting at the same time and when I wasn't glewed to the tv(because of the hockey matches) I did a little bit of kit designing or looked around in the garden. Oh, we have a new doorbell. The old one did work sometimes and then gave up again, changing batteries wasn't the solution, so yesterday Jan went out for another one. Hopefully this one will last a bit longer. Tomorrow Jan will have to go to his doctor at the hospital, we'll see what she has to tell him. Hopefully all will be rather well again. It looks a bit cloudy and grey today, well, they expect a bit of rain, but as from tomorrow all will be better again, in the weekend we might reach around 80F with a lot of sun, yippee! Oh, and I must not forget that my friend Heidi will have her birthday on Friday. May be later today, if it stays dry, Jan and I might take a quick visit to the market. at the moment they have loads of strawberries, and for a low price. I just love them, with a bit of iced sugar and a little cream, that is a great dessert! Sometimes they are also nice on a white sandwich for lunch. And also great for taking in a lot of vitamines. Our tomatoe plants are starting to have little flowers, so we should have some self grown tomatoes perhaps next month. 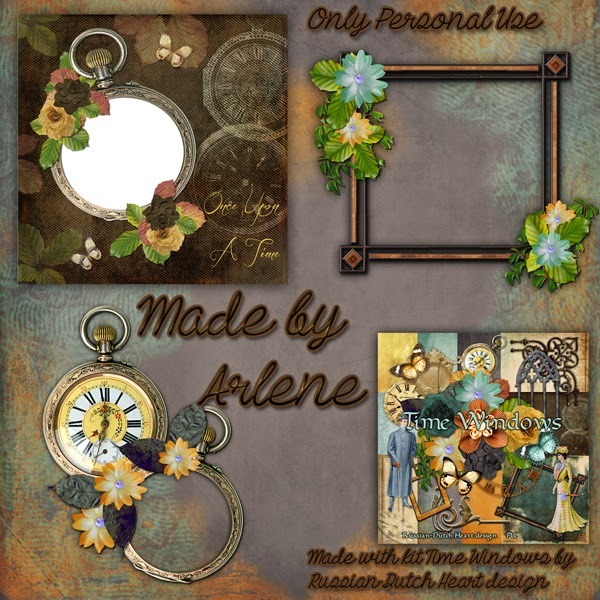 That is about all for now, so here is your freebie for today, the add-on by Arlene on the Time Windows kit. Hope you will find some use for it. Sorry for still not having the shoutbox. I am waiting to receive an answer(hopefully).
" We" started well at the WC hockey. We certainly spent a great weekend. The weather is improving every day, so we could sit for a while in the sun(even had to put up the parasol). Saturday I just had to buy us the weekend newspaper, but as there was a little fair taking place too I enjoyed the nice weather and walked and looked for a while. And I stayed a very good girl and almost didn;t buy a thing LOL! I only couldn;t resist buying two little plants for the garden. Then there was the start of the World Championship Field hockey of course. Well, both our teams started rather well and won their match. This month there is alos the World Championship Soccer in Brasil. But I am not sure at all that our team will go far in it, or they will have to change quickly their way of playing. We saw a couple of "practise matches", and I must admit they weren;t very impressive! Now there is a lot of talking on the news and sports programmes that there is a lot wrong with the World Championship soccer for 2022, that will be held in Qatar! Very much talk about that the assignment of it has been "bought"by Qatar, so we are talking about corruption. I am not at all surprised by it, bacuse the World Soccer organisation FIFA, has been "under fire"already many times. And we honest: to have a soccer main event in a country where there is a temperature of about 45 degrees C ( ca, 113 F!!) and where there is no soccer culture isn;t a good thing at all. Could even be very bad for the players, even harmfull for the health. I wonder if there will be a thourough investigation (we are talking here about millions of bribery money) and if proven the case, the Fifa willassign the event to another country. Here some artivcles about the case, and I really low the statements of Mr Blatter, Fifa president, him stating that he regretted the nomination of Qatar, and that it was a mistake, but that we make a lot of mistakes!!!! ), the guy has nerves!! So that was the "buuning"news of the weekend, LOL. So all weekend was filled with sport and garden time. How wonderful is that? Oh, and Saturday night there was a "detective night"on tv. we took some of them on dvd, but also watched some which resulted in going to bed far too late! It\s still a bit coll outside, but it will warm up later today and lost of sun is expected, with very little wind. So I will have to take care a bit of the house today(you know the drill, vacuum cleaning, remove a few dust bunnies, those kind of things), and in the evening there is a hockey match of our women team! Better I don;t start too late with that! 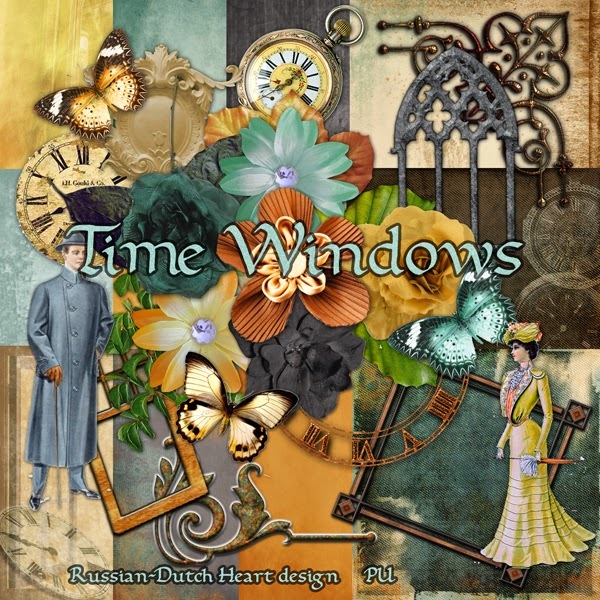 Here is the second part of the kit Time Windows. 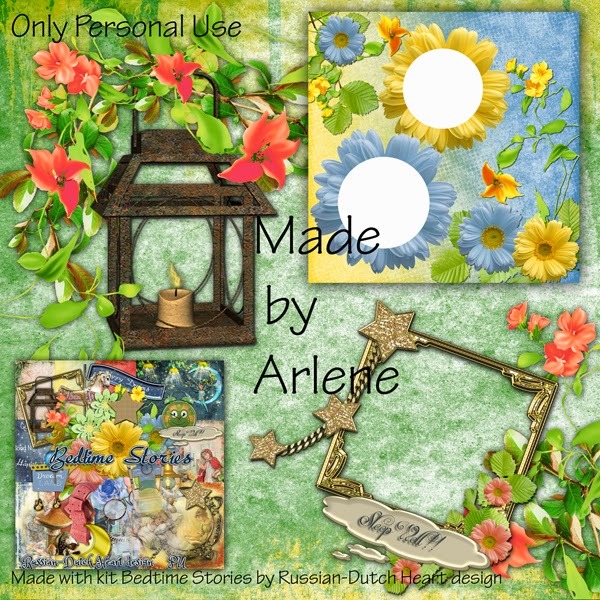 Wednesday I have the great add-on by Arlene for you. Have a lovely day, you all and thanks for visiting! P.S. still no luck with the shoutbox, I have no idea how to fix that. Will give it a try perhaps later today.